Odessey & Oracle is a French trio that merges old and contemporary song constructions to produce a folk pop feast for the ears. We’re glad they reached out to us as we’re always on the search for new music around the world. We weren’t expecting to hear Baroque-N-Roll this week… but we like the dreaminess of it. 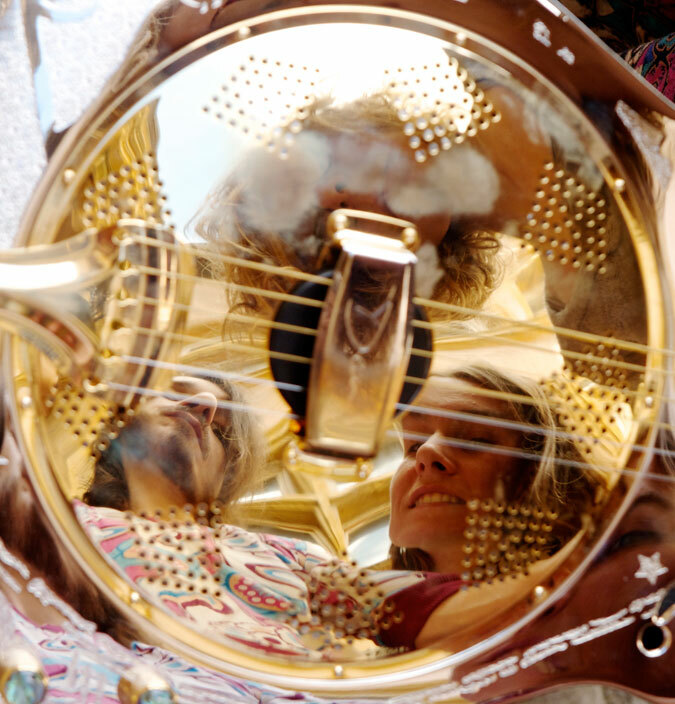 Odessey & Oracle’s new album, Odessey & Oracle and The Casiotone Orchestra, is coming out soon, but you can check out some of their soothing tunes before reading our Q&A with the band. 1. Can you tell us a little about Odessey & Oracle (name, age, city of residence, and/or background)? We’re a new band based in Lyon (France). We played together in previous bands but this new project began in 2013 during the recording sessions for the album and then we decided to play it as a live performance. Odessey & Oracle is a 3-piece band composed of Fanny L’Héritier (lead vocals and electromechanical piano), Alice Baudoin (electric harpsichord, synths, flutes and vocals) and Guillaume Médioni (guitars, dobro and vocals). 2. How did the band come together? Why the name Odessey & Oracle? Guillaume: I intended to record a full album of very orchestrated music and I asked friends to come and record some instrumental and vocal parts on it. During the sessions, I asked Fanny who sang most of the songs and Alice who recorded the keyboard parts to form a band in order to play the music as a live performance. Then we started rehearsing and rearranging together the songs for this line up. Fanny: First, Odessey & Oracle by The Zombies is one of our favorite album of all time and refers to some musical trends of the late 60’s when experimentation was everywhere even in pop songs. Plus, the name evokes mysticism and dreamlike poetry, which are themes linked to psychedelism. At last we like it for the beauty of words. 3. Can you tell us a little about your musical style? How much are you influenced by The Zombies? Alice: Our musical style is the result of our influences from pop music to classical music, mostly baroque music. I’ve played harpsichord for a long time but I also like and need to play a lot of different types of music. Our music can also recall some late 60’s British and American psychedelic bands with a particularly ornate style, sometimes referred to as “baroque pop”. Guillaume: We have tons of different influences (including The Zombies) but we’re mostly inspired by a certain freedom of these optimistic years during which experimenting was hip and heretics’ steps were acclaimed by the crowd. 4. Who are your influences? And who have you been compared to? Guillaume: There is too much ! Mainly from J.S. Bach to Brian Wilson through Caetano Veloso and the Brazilian MPB, Robert Wyatt, African music and English folk from the 70’s. Alice: I am also influenced by folk music, for instance Indian raggas, Bulgarian songs, Cajun, and French folk singers. Fanny: I would add medieval and Renaissance music, and English music from the 17th and 18th century (e.g. Purcell). 5. You have many musical styles going on at once. What’s the best environment for people to listen to your music? Should they listen while having dinner, studying, driving? We think our music is perfect for household activity! 6. What directions are you taking your music? Are you thinking of broadening the sound or working with DJs or filmmakers? We’d like to collaborate with other artists but for now, we need to experiment with new ways of writing and playing a lot of shows. 7. Do you have a full album planned? When it will it be released? Yes, of course ! Our first album called Odessey & Oracle and The Casiotone Orchestra is coming out in a few days. It will be available on Bandcamp and in a lot of indie record shops. 8. Where can people/fans see your band play live in the upcoming months? For the moment, we only have shows booked in France but we plan to tour outside soon… We hope to come to the East Coast by the end of 2015. 9. What are some new French bands or DJs people should be listening to? 10. Where are your favorite places to see live music or listen to new DJs? 11. Is there anything you’d like to add, promote or discuss? It’s time to talk about capitalism 😉 We hope someday one will be able to speak about capitalism in the past. We need to work on more solidarity, ecology, more creativity but not only for money.